The picture below is the culmination of a lot of time and work! All the meat chickens are now safely processed and in the freezer (this is only a third of it). It was hard work, I did them in two big batches and by the end I was shattered. The children helping to pluck the birds. I slaughter the birds, then dip in very hot water for a minute, before plucking. I tend to do this to every bird in the batch before moving on to gutting them and chopping off their feet. I then leave them to rest somewhere cool (my shed) for three or four days. This batch of chicken was all so big I jointed them all up as I just don't have the freezer space to have whole birds. I bagged up each portion into a meals worth for our family of five. The breasts weigh in around the 500-750 gram mark, so one of them would happily feed my wife, children and I for a meal. And a pair of legs another. So I got easily got three meals from each bird, then with the trimmings I made up some more and a few huge bags of wings for a treat tea for a couple of nights. The carcasses then got roasted before being added to my biggest saucepan (no where near big enough anymore) with some veg and made into lots of batches of beautiful stock on our new wood fired range. I felt very industrious! The freezers are full to bursting at the moment, I'm trying to be smart when I cook it and do big batches to save me cooking from scratch each night! The stock has already gone into a mixed dried bean chilli that I slow cooked and we ate last night (recipe to follow), so much better than using a stock cube! Leaving the birds to get bigger this time is much better for me. I'm doing the same number of birds but getting more from each, granted they are costing a lot more in food to get there but it saves me a lot of time. I think in future I might try and find another method of getting our poultry meat for the year, these birds haven't been the easiest this time and I don't like doing big batches really. I have been thinking about maybe looking at getting some Indian game chickens to provide us a much smaller but more regular supply of meat, or possibly Muscovy ducks, that are meant to be amazingly tasty meat birds. What route would you go down if your were in our situation to provide a regular supply of poultry meat for our diet? Could you sell some of the chicken meat or barter and swap for some beef, pork...? That's a good idea Dave. Hadn't really thought about it. Very interesting to know you let the cleaned birds "rest" for a couple/few days before packaging for the freezer. I admit we've never done that but have been reading you get a better flavored meat that way. Now I think it's something we should do. 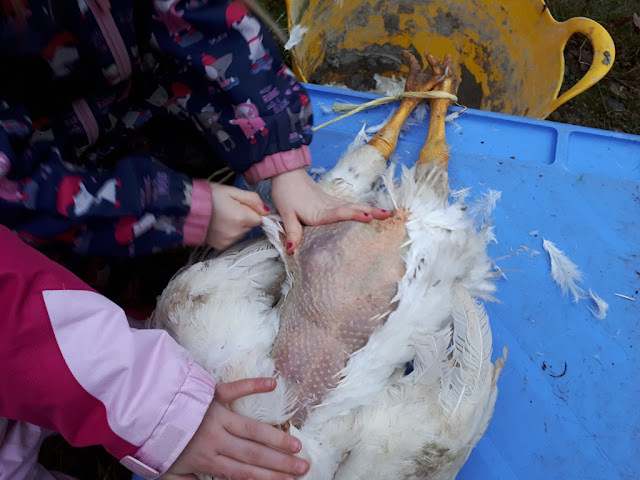 It's probably just personal taste but we don't enjoy the meat from our Muscovies nearly as much as from the chickens. It's all dark meat (which we do prefer from a chicken or turkey) but is drier, has a denser texture and not as much flavor in our opinion. (I've been making barbeque with most of it.) Also, I don't care for the broth made with a duck carcass as it doesn't seem as full-bodied or flavorful. Will be interested in hearing of your experience if you do try raising Muscovy ducks for meat. It was my butcher who said about it as I said I was going to do the Christmas chicken two days before we needed it and he said I was mad and need to do it five days before. Meat is much more tender than way as well. The muscovy is only an idea, not sure what is have to do pen wise and how venerable they'd be to predators so need to do some research first really. Get a machine to do the plucking! I made a 'Whizbang Chicken Plucker' and love it. COMPLETELY plucks all the feathers from a bird in about 30 seconds. This takes almost all the 'dogwork' out of butchering chickens. Look it up online. With your skills, you can make one easily. They last forever, and again, work! Also, I strongly agree about letting the meat cool and age before freezing. The meat is so much more tender and tasty. Love the red fingernails - you or one of your girls? GRINS (We only had boys, so I love seeing your kids too). I remember you said about this last time, I've looked but haven't got round to building one yet, it's something I think about when I'm about 3 chickens in! Really need to get on and build one, maybe it's something I should add to my list of future projects. Letting the meat stand like that really works doesn't it? So much more tender by doing it, also means that everything isn't such a rush at the time as well and butchery can happen later. Finger nails not mine although they frequently get done! My hands are far bigger! Oh, and by the way, I did a bread making blog post this time just for you in my Oakdale Farm Report. Hope you enjoy it! Love it! I must add your blog to my blog roll on the side of the page here. would little and often help? Will you need the space in the freezer for veggies? Yeah, at the moment freezers are used mainly for meat and even then theres a waiting list for what I need to process next so I have room. At the moment I can store nothing else in any number until we've eaten our way through it a bit. 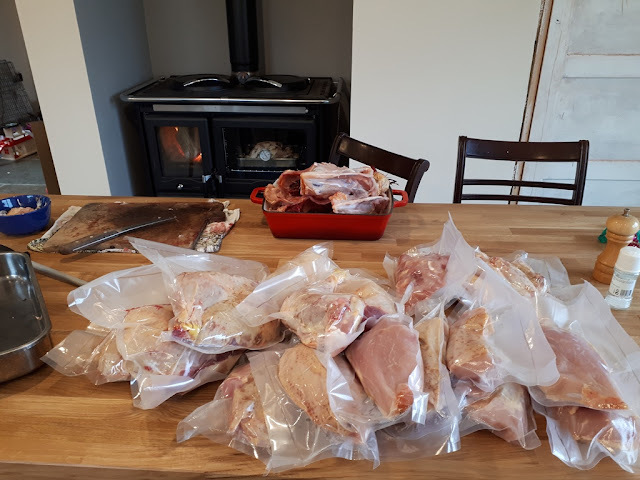 that said I think theres a lot of things that could come out of the freezer and be used up, lots of bones to make stock for one but I have enough stock for the next six months probably! I have done in the past but still have lots from the lamb last year. I think I can produce far more than I can use to be honest. Need to start using it more often. The mixed bean stew was a great use of it. And I'll be making lots of stews and soups in the next few months. Trouble with canning it is I never have enough jars and it takes a long time, maybe if I have some jobs where I', in the kitchen for a long time I'll do another batch. Good suggestion though and something I should do more often. We always used to butcher our own chickens (for over twenty five years) but it was indeed a big task. This year we took them to a wonderful small family owned processing plant and it cost about $3 per bird to have them do all the hard work. Still so worth it!